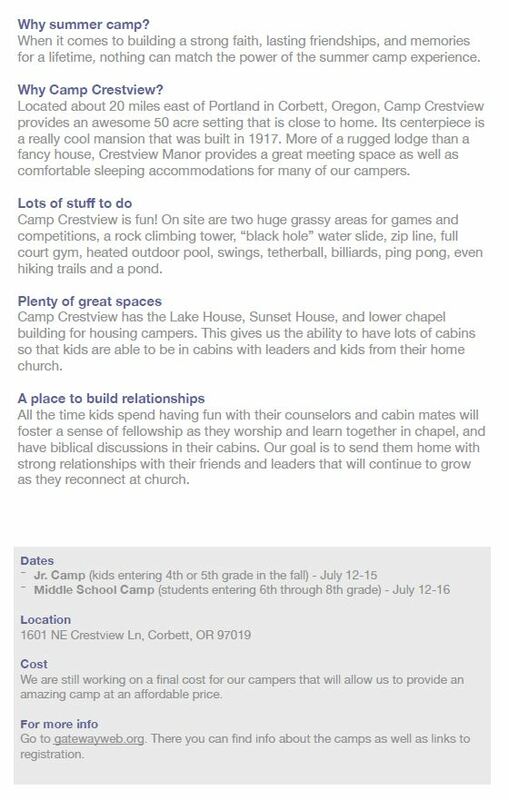 For the first time this year, Harvest is joining with other local churches to create their own awesome camp for middle school students! 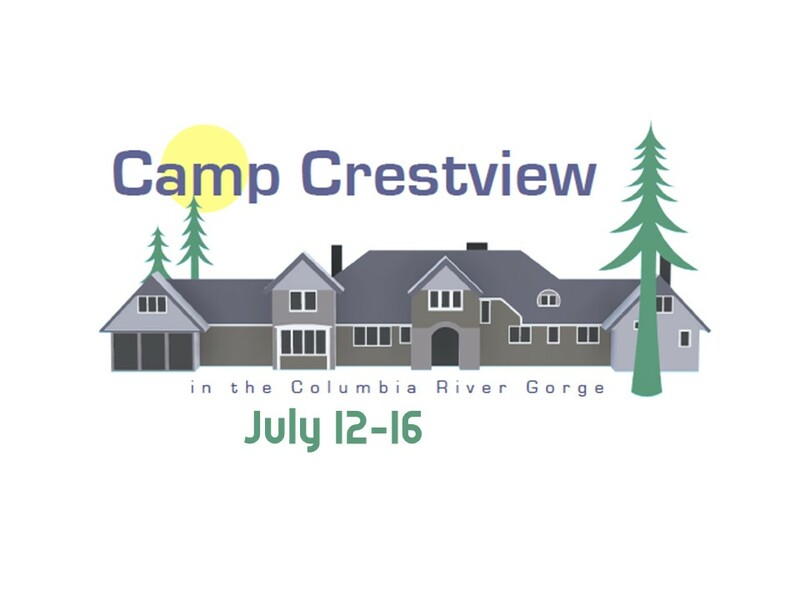 Camp will be July 12-16 and held at Camp Crestview in Corbett, Oregon. 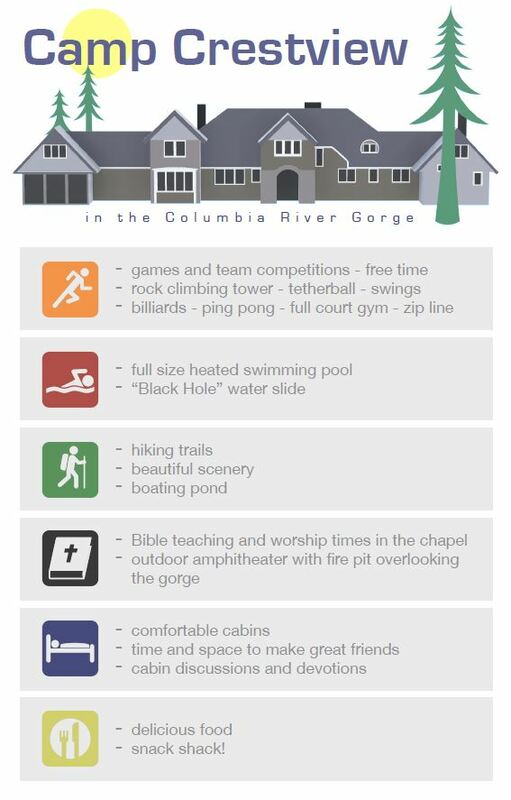 There will be many activities to participate in and lots of fun to be had, as well as Bible teaching, worship times, and cabin discussions. Parents will be required to provide transportation for their student to and from Camp Crestview. The camp is about a 45 minute drive from Harvest. Carpooling is encouraged. Let us know if you need help finding a ride! Check in will be at 4pm on Thursday, July 12th. You can purchase t-shirts and other merchandise on site so come ready with cash or check! Students can also make a snack shack account for the weekend. Pick up is at 10am on Monday, July 16th. The early bird cost is $275. You can qualify for this early bird cost with a $100 deposit. After June 20th, the cost will go up to $325. Checks can be made out to Harvest Church with "Crestview" and your student's name in the memo line. You can also pay online by selecting "Youth" and "Crestview" in the subaccount options. In addition to registration and payment, a Harvest medical release form is also required. Click here to download the Medical Release Form! PLEASE DO NOT BRING: any electronic devices (cell phones, ipods etc.,) pets, fireworks, weapons, drugs or alcohol.